The best dive knife is one that will work in that instant you need it. Like many other knives, it isn’t a weapon. It’s just a tool to be used that will help to keep you save when there’s a dangerous situation in the water. Most divers never use their knife for anything other than getting untangled from some discarded fishing line or cutting through a rope. It’s usually the only tool you have with you, so it needs to be as versatile as possible. There is a ridiculous amount of different shapes and sizes to the modern dive knife. How can you choose the very best with all of that variation? This chart helps to make the decision more manageable, showing you the information about the best dive knives so you don’t just have to choose one that looks cool. What Are the Basics of a Dive Knife? You’ve got two basic options with the modern dive knife: folded or fixed. Folding blades are smaller and more compact and fit into pockets. Because they fold up, the risks are reduced that an accidental puncture is going to happen. If you’re wearing gloves, however, a folding knife can be a little cumbersome. 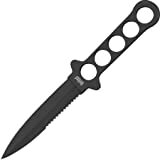 Fixed blades are the usual diving knives that you’ll find today. The best thing to consider with this type of blade is the sheath that helps to protect it. If the fit isn’t smooth and easy, then there’s a good chance that you’ll drop the knife during a dive. A tight fit can also lead to an accidental slicing or puncture that you don’t want. What Are the Advantages of the Best Diving Knife? The best dive knife is typically made from titanium. This is because they are incredibly strong and are resistant to corrosion. Titanium knives can sometimes be problematic, however, because they can be difficult to sharpen. Because they are maintenance-free, however, they could be a viable solution for your diving needs. Steel knives are a good second option. They hold an edge well, are easy to sharpen, but require more overall maintenance to keep them from rusting. Steel knives come in two different types of alloys. The 300 alloys are more like titanium knives – easier to care for, but more difficult to sharpen. 400 alloys stay sharper and need to be protected from rust. Serrated or straight edge blades are typically user preference, but do get a line-cutting notch and look for metal handles first to get the best possible experience. 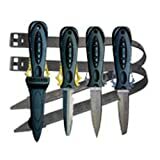 Most dive knives are going to be found on a site like Amazon for around $50 and be a great knife. Some are cheaper and require more maintenance, while others are more expensive and require more effort to sharpen. 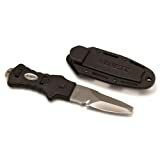 This is a virtually maintenance-free dive knife that has a rubber handle that’s been ergonomically molded for good leverage. The titanium blade is strong, but does need a little help in the sharpening department over time. There’s a titanium hammer on the handle bottom and is surprisingly lightweight. With the included strap and sheath, you’ll be able to bring the knife along on virtually any dive and not have any difficulty. Select a sharp tip or a blunt tip to have all of your preferences met and you’ll have made a great investment. This 5-inch titanium knife looks fierce and provides a good, consistent result. There’s a serrated top edge that works to cut through the toughest of materials, while a line cutter for safety is also included. A finger guard on the tang helps to secure the grip while keep the fingers from getting sliced and cleaning the knife is a simple process thanks to some of its assembly features. The sheath offers a quick-release design and the rubber leg straps are appropriately comfortable. The cap is made from stainless steel that is equally resistant to corrosion and this all adds up to one of the best knives around. Why is this one of the best dive knives available right now? Take a look at the locking mechanism and you’ll see for yourself. You’ll have to lose the entire sheath to lose this knife on a dive thanks to the patented locking system. All you’ve got to do is squeeze the handle, however, and you’ll be able to have the knife ready for use. It features a tanto tip, which some divers may not be so keen on having, but the 3 inch blade is super strong and easy to reach. It’s light, useful, and stays rust-free. That’s what makes it a worthwhile investment. If you’re on a tight budget, the Stingray knife offers an extremely lightweight, durable design that will stand up to any other dive knife. The 4-inch blade is made from AUS6 stainless steel and the sheath has a built-in impact resistance that will protect the knife. The holes in the tang do more than just provide a firm, lightweight grip. They also help to keep water funneled away from your grip so that you’re less likely to lose the knife. As long as you clean and season the blade after a dive, this knife will last a long, long time. A blunt tip knife is an essential tool for a diver as they help to reduce the risks of a tip point puncture without compromising on the sharpness of the blade. The sheath is made from Kydex and features a quick-release design and plenty of attachment options so you can be comfortable with it out on the water. It disassembles for easy cleaning and has a price that every budget can afford. If you need the best dive knife, then this one must be considered. The best dive knife doesn’t have to cost a lot. For an affordable price, you can get an awesome tool that can be used when you need a little help in the water. Use these dive knife reviews and the information here to find the best tool possible and you’ll be safer on your next water adventure.